Hello all, The official release date for the new CD, "Carol Sudhalter - Live at Saint Peter's Church" was moved to January 18. It will be available on Amazon, ITunes and other media by (I believe) February 8. You can continue to order from me in the meantime (form below). WEDNESDAY, February 6 - 7 to 10 pm - Flushing Town Hall: Louis Armstrong Legacy Monthly Jazz Jam. Joe Vincent Tranchina, piano; Eric Lemon, bass; Sylvia Cuenca, drums. Great atmosphere. $10 general admission, free to participating musicians. Please sign list by 9:15 to participate. 137-35 Northern Blvd, Flushing. SATURDAY, FEBRUARY 9 - 8 PM to Midnight - Cleopatra's Needle. Carol Sudhalter Quartet. Carol on tenor sax/flute, Patrick Poladian, piano, David Ruffels, bass; Doug Richardson, drums. Broadway between 92 & 93 St., NYC. No cover, $10 minimum, delicious middle eastern food! SUNDAY, FEBRUARY 24 - 5 PM - "House Concert" - 5-50 Studios, LIC. Patrick Poladian (pno), Carol Sudhalter (ts/fl). 5-50 51st Ave., Long Island City, NY 11101 (by the Vernon-Jackson stop of the #7 train). Admission fee pays band! refreshments served. Res. 917 667 5331.
releases Live At Saint Peter’s Church, a set filled with superior compositions, inventive playing and swinging music. “A by-product of the current redressing of discrimination against women in government, the military, education, the professions, the arts, and elsewhere has been the realization throughout the jazz world that there are within its ranks countless and too-long-ignored female instrumentalist who are every bit as talented as their male counterparts. Saxophonist, flutist, big band and combo leader, producer, and educator Carol Sudhalterhas since the early 1970s been a leader, a pioneer really, in advancing the cause of women in jazz with her efforts to bring them to front and center in the performance arena. That she is uniquely equipped as a model in terms of her extraordinary artistry is made abundantly clear by her new CD Carol Sudhalter at St. Peter's (Alfa Music), an especially welcome release as a display of her world-class distinction on baritone saxophone and flute. In her career, Carol Sudhalter has proven herself to be one of jazz’s top baritone saxophonists, a fine flutist and an original tenor soloist, leading over ten albums of her own. Live At Saint Peter’s Church features her at the head of a tight and complementary quartet that includes pianist Patrick Poladian, bassist Kevin Hailey and drummer Mike Campenni. The music is straight ahead modern jazz with a few surprising twists. One of Tadd Dameron’s finest songs, “On A Misty Night,” serves as an excellent introduction to the quartet with Ms. Sudhalter displaying her deep tone on baritone and each of the musicians having an opportunity to be featured. The lesser-known Benny Golson piece “Park Avenue Petite” is a haunting ballad that is well deserving of a revival; Sudhalter and bassist Hailey take melodic solos that build on the atmosphere. The leader switches to flute for Bill Evans’ moody “Time Remembered” and swings hard on Hank Mobley’s “Funk In Deep Freeze” with the latter also including an excellent solo by pianist Poladian and a fine drum chorus from Campenni. Growing up in a musical family that had a father who played alto sax in the New England area and two musical brothers (including trumpeter and author Richard Sudhalter), Carol Sudhalter started on the flute while in college. She studied with Ran Blake and Phil Wilson at the New England Conservatory Of Music, took up the baritone sax, and in 1978 moved to New York. She played with the first all-female Latin band (Latin Fever), founded the Astoria Big Band (which has now been active for 33 years) and has worked with such notables as Etta Jones, Chico Freeman, Jimmy McGriff, Sarah McLawler, Henry Butler, Jimmy Cobb and Jason Marsalis in addition to leading her own groups. Carol Sudhalter has performed in nearly every significant New York jazz club, at quite a few festivals, and regularly tours Italy, the United Kingdom and Switzerland. She has led over ten albums of her own, primarily for the AlfaMusic and Carolina labels. 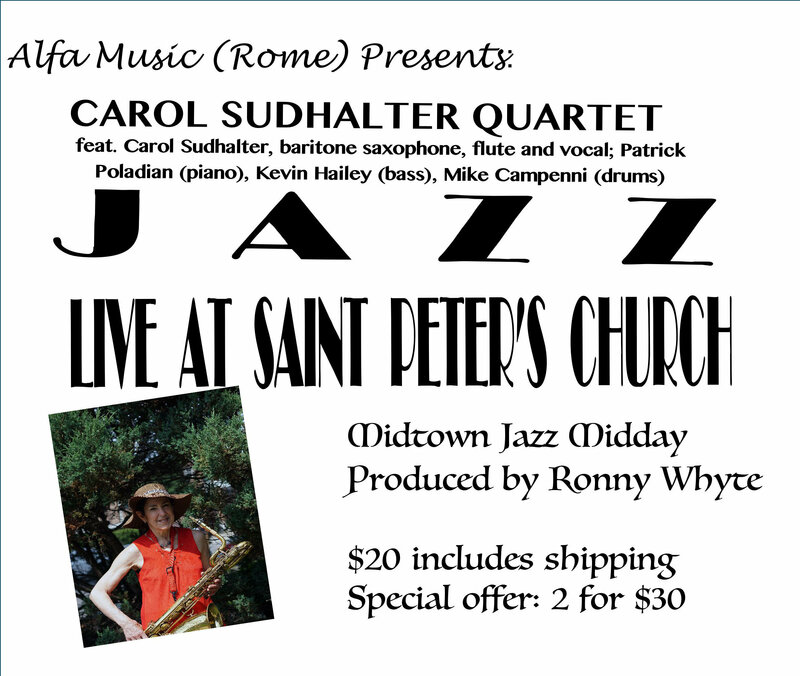 Live At Saint Peter’s Church features Carol Sudhalter in top form with her quartet, and it is a significant addition to her musical legacy.